Visit the Clareview Branch of the Edmonton Public Library and something a little out of the ordinary is sure to catch your eye. At 8 feet tall and 8 feet wide and 6.5 feet deep, the newest addition to EPL’s art collection is a big one. 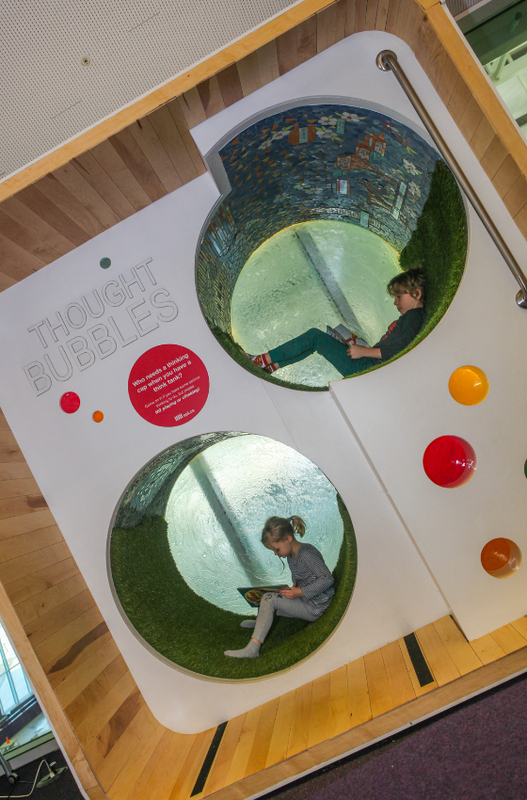 Dubbed “Think Tank,” it’s situated along a glass wall that separates the library from the Clareview Community Recreation Centre’s swimming pool. With a white exterior, rounded corners and circular “thought bubble” accents, the almost-cube has a clean modern look that’s aesthetically pleasing as well as inviting. It features two large cylindrical pods, big enough for two adults (or several children) to sit comfortably side-by-side in each. 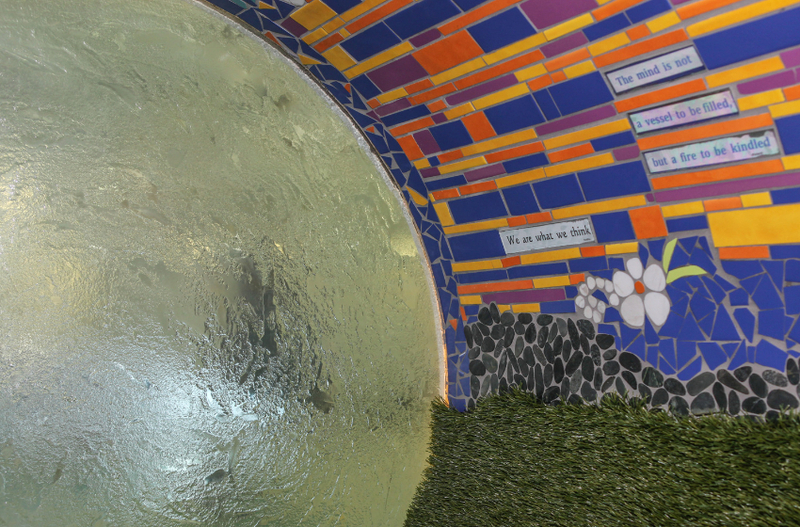 The bottoms of the pods are lined with AstroTurf; the tops are comprised of intricate tile mosaics featuring flowers, bright colours and inspirational quotes from figures ranging from Albert Einstein to Winnie the Pooh. There are colour-changing lights on the outside of the structure and speakers inside the pods that people can plug into directly to play their own music. There’s also a glass panel on one side, designed for dry erase marker messages or doodles. Created for a competition in the Vignettes Design Seriesopens a new window, a local design festival, the Think Tank was conceived and created in the space of a single week. The competition uses a lottery system to match up a small team of artists, designers and construction professionals. Most of the projects developed for Vignettes are torn down and disposed of after the competition and its accompanying showcase are over. However, it was important to the Think Tank team to create something that could be useful afterwards. This turned out to make the process much more complicated, as they not only had to design a structure that could be built, but also one that could be taken apart and reassembled. It was a process that was worth it in the end. The team decided to donate the piece to EPL because they wanted it to be accessible to the community. Plus, it turned out to be a good place to curl up with a book, something Brenda Brix, one of the lead designers, realized during the construction process. EPL strives to create spaces to share content created by Edmontonians, whether that’s the work of local writers through Capital City Press, local musicians through Capital City Records or artwork from local artists displayed at community gallery spaces in branches. The Think Tank—with its focus on creativity and its comfy reading nooks—was a natural fit. The Clareview Branch was selected as the piece’s new home because there was enough room for such a large item and it would be both visible and easy to access. 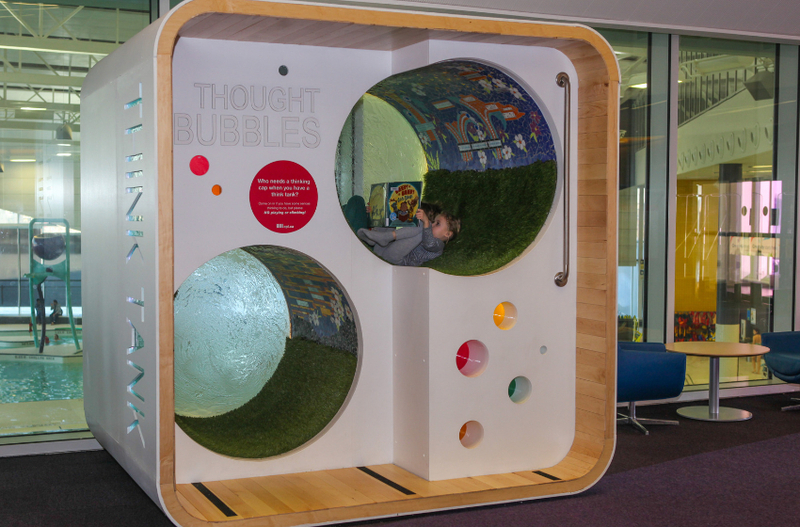 Youth Services Librarian Tamsin Shute, who was involved in the decision to accept the Think Tank, likes how the Think Tank provides opportunities for customers to engage. Interested in seeing the Think Tank for yourself? Visit our Clareview Branch and climb on in!